This episode feature a lecture by Dr. Caldicott at the retirement community of Kendal in Hanover, New Hampshire, on March 31, 2011. The program was recorded just two weeks after the Fukushima disaster. Early in her presentation, Dr. Caldicott mentions the book Radioactive: Marie and Pierre Curie: A Tale of Love and Fallout. She mentions her debate with English writer George Monbiot a month after Fukushima. 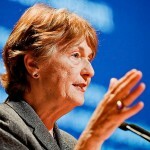 Read Dr. Caldicott’s article How Nuclear Apologists Mislead the World Over Radiation. She also refers to her book Nuclear Power is Not the Answer. Some of the topics Dr. Caldicott covers in her lecture are radioactive waste, what happened when the Fukushima reactors were hit by the March 2011 tsunami, how 40% of Europe is still registering radioactivity after the 1986 Chernobyl meltdown, the New York Academy of Sciences report that states that close to one million people died as a result of Chernobyl, how U.S. and Russian nuclear weapons are still on hair-trigger computer alert and poised to blow up the world by accident or presidential directive, Obama’s hypocrisy in building a new generation of nuclear weapons while giving lip service to disarmament, the revolution in public participation needed to prevent nuclear war, and her books The New Nuclear Danger and If You Love This Planet. Following her talk, Dr. Caldicott answers questions from the audience. Read Dr. Caldicott’s December 2011 article in The New York Times, After Fukushima: Enough is Enough. This entry was posted on Friday, December 16th, 2011 at 12:00 am	and is filed under Uncategorized. You can follow any responses to this entry through the RSS 2.0 feed. Both comments and pings are currently closed.